A lowly potato has few aspirations. Herbert knew his purpose maturing in the soil. He had been created for sustenance and he did not fear his destiny. When his skin hardened and his starches formed, he knew the time had come. Throughout his harvesting experience, he set forth his intention to be enjoyed. To be prepared with love and devoured with pleasure was the highest hope he or any of his fellow tubers could conceive. Holding onto his dream, he waited in the market and celebrated when he was purchased and transported to a residence. Stored in a bushel basket with several more of his kind, he waited patiently in the cool dark pantry. His whole world changed when he saw her. She gleamed like a star from the wire shelving above him, so Herbert decided to call her Celeste. He wondered if she would be offended by this, having a name already. Did a soda can have thoughts like he did? If so, would she communicate with him? Perhaps the thought of conversing with a sod-speckled spud was distasteful. Or, maybe she was choosing not to reach out to him because her sisters so closely chained to her might disapprove. He decided none of that mattered. Her precisely machined shape and bright colors intrigued him, so he gazed lovingly at her with as many of his eyes as he could. Celeste’s body seemed to attract and magnify the light that crept in from between the slats in the pantry door. She shimmered even more brilliantly when the door opened. Herbert watched as human hands took items from the pantry, but it wasn’t until he saw those hands grasp the cylinder of one of Celeste’s sisters that he wanted to be a human. Only a human could truly experience Celeste, holding and feeling her with sensitive fingers — fingers that could trace the smoothness of her body and the sharpness of her edges. He yearned for ears to discern any sounds she could make. He wished for a tongue to taste her and a nose to smell her. The intimate details of her essence were lost to him. He cursed his limitations. With each opening of the pantry door he wished for another day to bask in the glory of his Celeste. As her sisters and his fellow potatoes were taken, his wishes became desperate pleas. If there were a potato deity, Herbert was throwing himself at its mercy. Too soon, it seemed, Herbert was lifted from his bushel basket. He watched Celeste fall away beneath him and disappear. His pleas for more time went unanswered. Herbert’s skin was scrubbed, pierced and oiled. 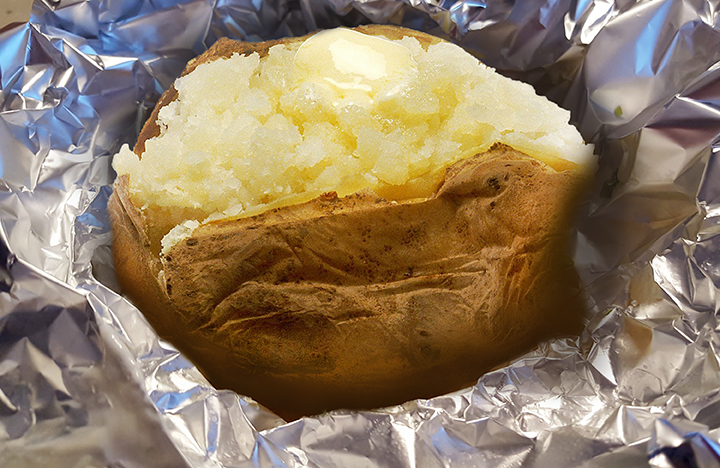 Wrapped tightly in aluminum foil, he was placed in a hot oven to bake. He felt his starches break down into sugars from the heat. His original dream was coming to fruition. He was going to be consumed. But Herbert was in love, he had transcended his small potato aspirations. Losing his perception of time, he struggled to focus, to remember Celeste before there was nothing left of him. Then in the next moment it seemed, he was on a plate and the foil was peeled away. A knife sliced through his crisp, brittle skin and his now soft innards were pushed up. He was seasoned. The salt, pepper and butter sent new sparks of sensation through his consciousness. He could feel rather than see the great salt mines, and the excavation and iodization. He sensed the growth of the peppercorns in the field. Their harvesting was not unlike his, but the impression of being dried and crushed felt peculiar. The butter told a longer story of life as a bovine grazing in a pasture. The sensation of the milk extraction, the separation of the cream and the churning gave Herbert a new appreciation of his simplicity. The salt, pepper and butter merged with him in his new cooked state and added to the whole of his experience. Reveling in this new awareness, he barely noticed the transition to a new space. As the shock of the merging subsided, Herbert became mindful of the small table his plate now rested on. His awareness stretched out to the other items on the table with him. Two cylinders, one tall, clear and open at the top with clear cubes at odd angles filling its interior space. The other, to his delight, was his Celeste! Herbert’s newfound joy subsided when he felt a portion of himself being lifted away and placed into a warm, moist cave. Agitation and dissolution, then another sense of expansion as he became aware of what had ingested him. Immediately, his awareness became focused in a totally new way. Through this being, he could sense an entirely new dimension of physical depth. And, with the sensation came human understanding. The taste of himself, the potato, with butter, salt, and pepper were closely connected to the smell. He could feel his substance being chewed and swallowed and he knew he was dinner. He saw himself on the plate, he saw Celeste, and beside her, a glass with ice. He saw the markings on Celeste’s container and understood their meaning, she was a soda, a Sierra Mist. It was overwhelming to simultaneously be aware of himself and to see himself from an outside perspective. Another bite taken and Herbert gained even more insight. There was a sense of identity: the human was a fruit-bearer, a female. She had a name, Nicole. Permeating this were feelings of being separate from everyone and everything else. And, with that came loneliness and an attitude of resentment for having to present herself in a certain way to be accepted by others. Learning did not happen from an internal feeling of rightness, but from external stimulus. Those others, parents and teachers, instructed and trained, monitored and judged. Even more foreign to Herbert was a constant string of language and images, the concepts coming through in fragments. Herbert couldn’t believe he had once envied these humans. These new physical sensations were a small reward compared to the constant noise and feelings of separation. How did these beings function with their attention diverted away from the essence of life? His wandering awareness regained focus when he felt the soda can in Nicole’s hand. He watched her fingers lever the tab up and back, snapping open Celeste’s mouth. The liquid inside fizzed and popped, spritzing effervescence out of the opening. Nicole’s hand lifted Celeste and poured her contents into the glass. The clear liquid foamed, a white rush of excitement, then subsided but continued bubbling softly. Nicole’s hand moved to the glass, lifting it. Herbert’s anticipation heightened by this new shared awareness. Nicole expected the cool refreshment, the sweet taste, the feel of carbonation on her tongue and throat. Herbert was eager to merge with Celeste. The liquid passed easily and with another bite of Herbert’s substance he could feel his connection to Celeste. Her story was dramatically different from his. She had very few roots in biology. Her existence in nature was brief. All of her natural components were modified chemically. Herbert felt the sterile laboratory, processing factory and packaging plant. The creation of her container was a distant and separate thing and perhaps slightly more natural that her contents. He had faint impressions of the aluminum ore and the bonding with additional materials to form an alloy. He could sense the sheets of metal being stamped, pressed and formed into the cylinder that had sparked his fascination. Bite after bite and sip after sip, their consciousnesses merged. Herbert and Celeste were blending into Nicole. Soon their individual essences would give way and their existence as they knew it would be changed forever. Herbert was grateful for his life as a potato. He was even more appreciative of his experiences. He felt beyond what had been his material self and knew that his purpose, although simple, was never truly complete. Aware of his physical starches breaking down into glucose as his smallest particles were carried through Nicole’s bloodstream to fuel her cells, he knew he could never cease to be. His second wish had indeed been fulfilled. He had become a human. This new adventure was just another beginning. **This short story was my response to the prompt: Take the following list of six words and use them in a story, between 1000 and 1500 words: potato, carpet tack, shed, razor, outlet, soda can. Use them in any order, as nouns or verbs (as appropriate), in dialog or exposition, but use them creatively. This story was originally submitted to my writing group in November 2010. I revisited it with my group again for our December 2016 meeting. What I’ve submitted for this post is culminated from all the feedback I’ve received. If you have any thoughts or comments, I’d love to hear them. I’m simultaneously disgusted and hungry. Success! I loved it! There’s a little potato in us all. Too creative for words.